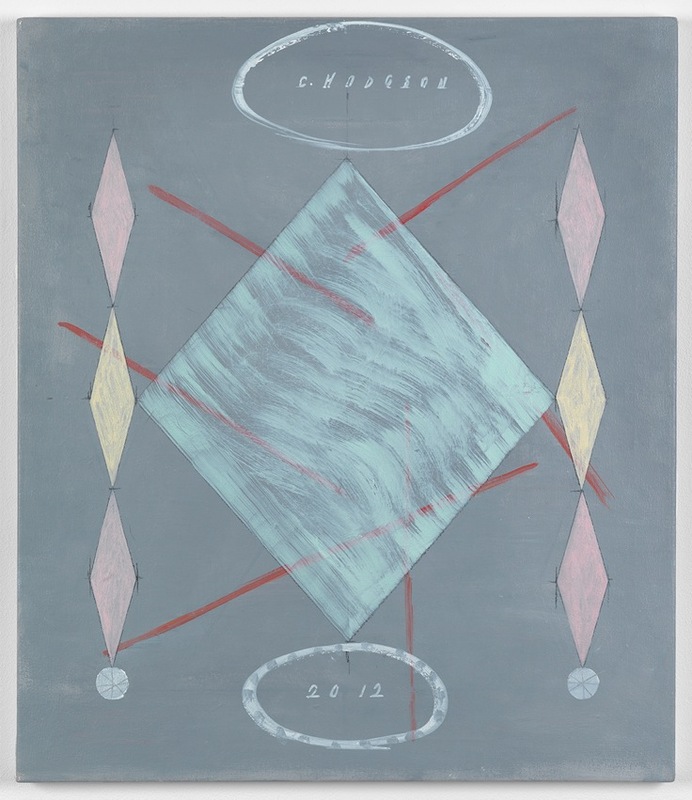 The Page / ‘Bloomberg New Contemporaries 2014′, World Museum, Liverpool and ICA, London. Much has been made of the supposedly socially engaged, demonstrative nature of ‘Bloomberg New Contemporaries 2014’. Journalistic bridling has kettled the inherently diverse whole, mistaking the cinematic vista of Alice Hartley’s We’re All Very Disappointed (2013) for an exhibition statement. 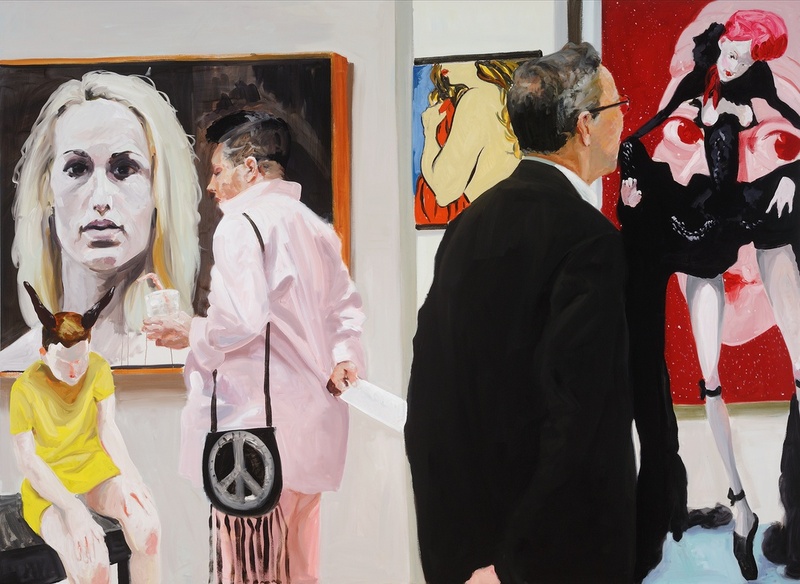 Hartley’s billboard sized outcry is, at a glance, a defaced maelstrom of abstract expressionistic protest. Up close, the surface is revealed to be a series of smooth, neatly aligned prints, a whispering wallpapered reproduction of unrest rather than its fractious frontline. 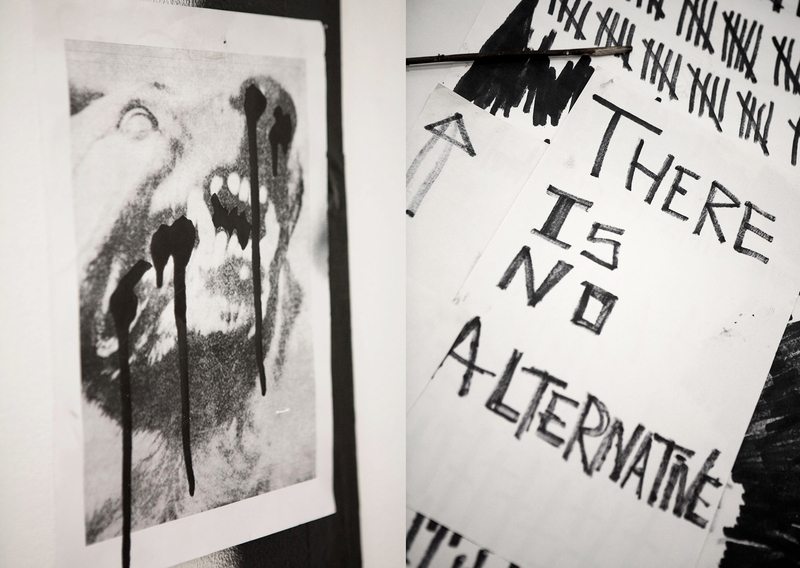 Any statements of dissent, such as Marilia Stagkouraki’s nihilistic scrawls, seem to grow from an interest in protests’ form or representation by the media, rather than art functioning as a kind of civic antagonism itself. A good starting point would be to ask who are the we in We’re All Very Disappointed and BNC2014. 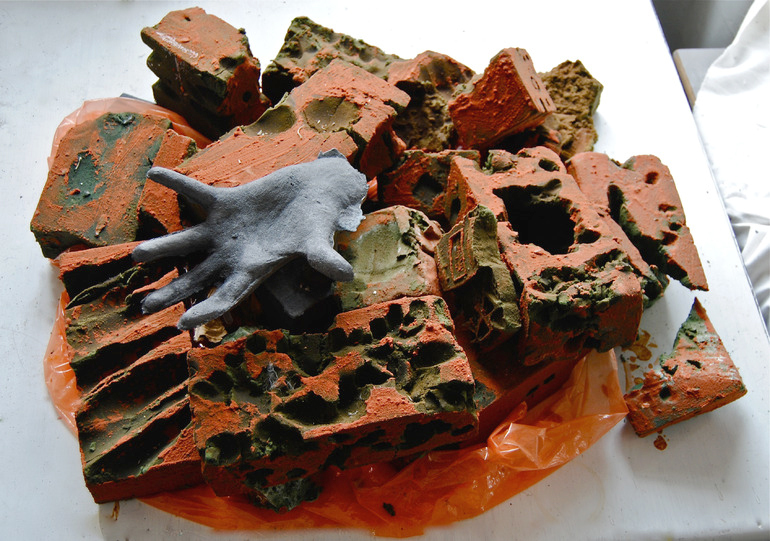 The 55 artists in this year’s edition are recent graduates of UK art schools. 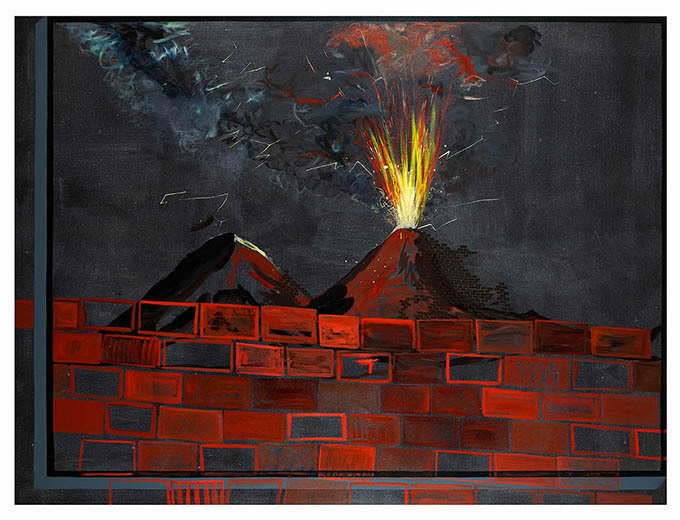 Unveiled through a process of anonymous selection, the show gathers those left standing, daubing, grimacing, smashing, dangling and projecting into a reliably varied, assiduously energetic annual exhibition. A tendency with survey exhibitions is for interpretations to over-reach for conclusions and a tidy theoretical unity. Rooted in the melting pot of education, and the breadth of age, backgrounds, and artistic allegiances that this brings, means BNC’s richly anomalous energy is pleasingly hard to narrow down. 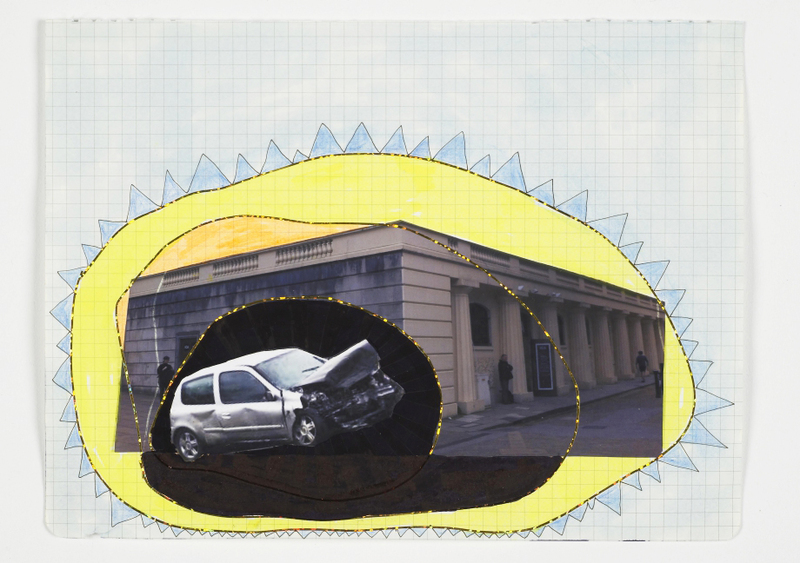 The best approach is to embrace its Byronesque tendency towards digression, and at its best Bloomberg New Contemporaries benefits from a Byronic-curator who is happy to keep changing the subject, and coax us out of our fixation with plots. At the ICA, all film and video work has been gathered into one nebulous, flickering room, and subsequently the exhibition lacks movement, collectively missing the tidal overlap of multiple moons washing over the whole. The second upper gallery seems to have been tempted into bracketing varied work under the auspices of ‘the grotesque’, the distinct projectiles of assorted stains, vomit, ghouls and opulent obesity gathered as unwilling parts of a putrefied picnic. Digression is fundamental to BNC’s project, and the best way to measure these artists’ mutations to contemporary arts’ DNA would be to give their emergence from the convergence of education free reign. Castle (2014) by Jonathan Meira recalls the overgrown jungle temples of Cambodia, their masonry strangled by a tapestry of tentacle-like roots. 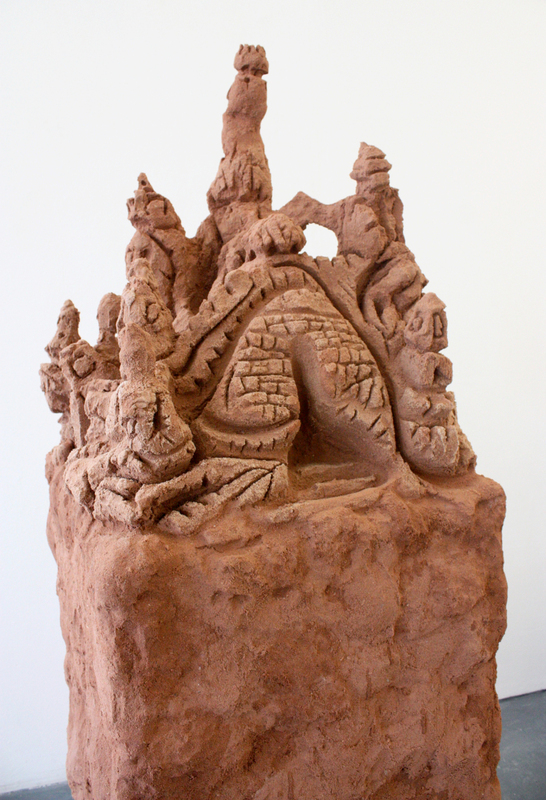 Meira’s sandy citadel is a squall of grainy, spiraling intestines heaped upon a broken, teetering plinth. Its momentum carries us through three stages of process as the turgid, ochre pile of builders’ sand unexpectedly forms an apprehensive tower before, high on the success of its unexpected assent, it bursts forth in architectural song. This apparently assertive acquiescence could of course be read in reverse, with the adornments destined for the unformed building site heap from which they arose. Meira’s sandy citadel is a squall of grainy, spiraling intestines heaped upon a broken, teetering plinth. The tonal depth of the mazy channels carved into the castle’s edifice creates a whistling, sketch-like surface. The contrast between the meandering lines and the solidity of the building within, like the overwhelmed ruins they echo, make a kind of poetic sense; why wouldn’t a Buddhist temple be ultimately intended as an elaborate plant pot for nature? For Meira, history, or the concentration of retrospective form, seems to be a solid foundation upon which to formally and conceptually jam. The playful evocation of sandcastles adds another layer to Castle’s melancholic nod to regal or even aspirational hubris undone by the sands of time. 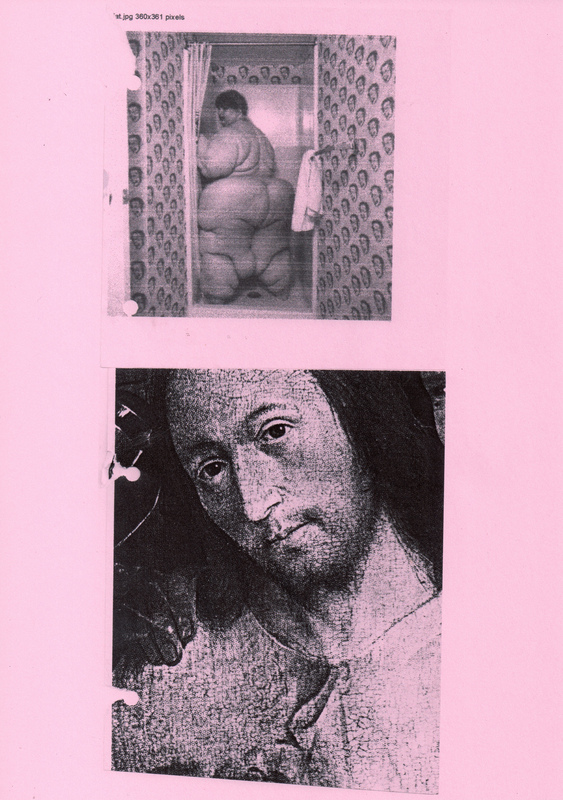 The Page reviewed JESUS FAT (2014) by Ebrel Moore when it was selected by Paul Noble for Creekside Open 2014. 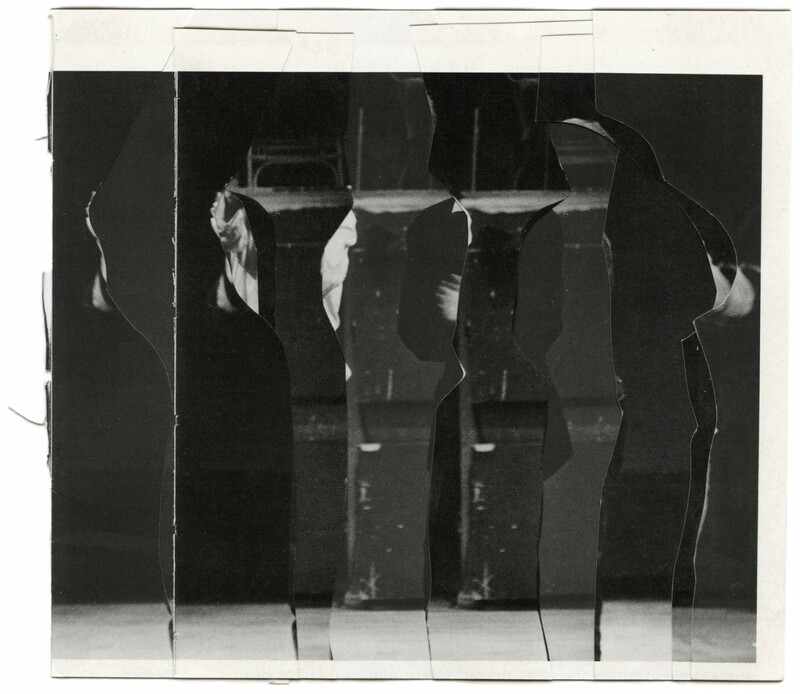 Exhibited then as a single print, this version chimes with Moore’s practice of reconfiguring work in different settings. 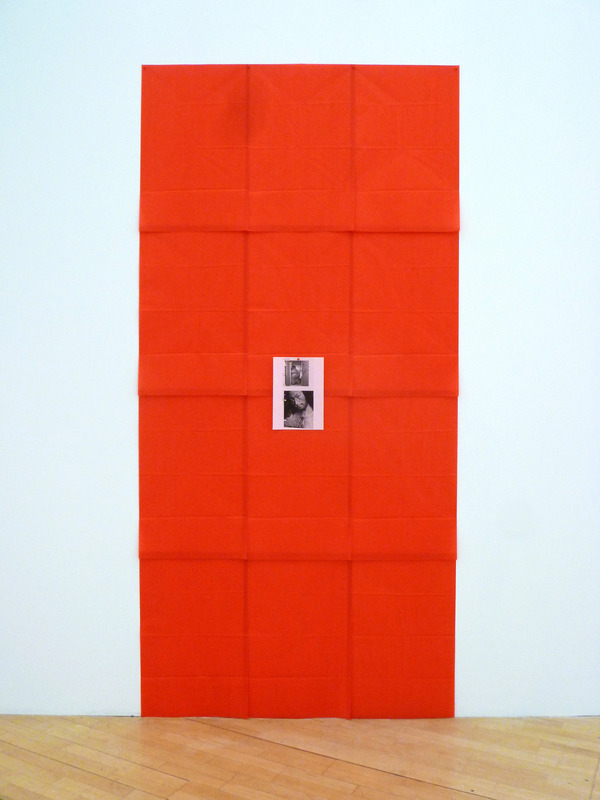 In BNC2014 the faded central image is framed by a large, glowing rectangle of thin red tissue. Illuminated from within by the white wall like an oil glaze over a white canvas, this delicate acidic halo draws you into the puzzle of the inner collage like a giant petal, developing the ambiguous moral interplay between its two figures and resetting the scene as a kind of philosophical Venus flytrap. this delicate acidic halo draws you into the puzzle of the inner collage like a giant petal, developing the ambiguous moral interplay between its two figures and resetting the scene as a kind of philosophical Venus flytrap. 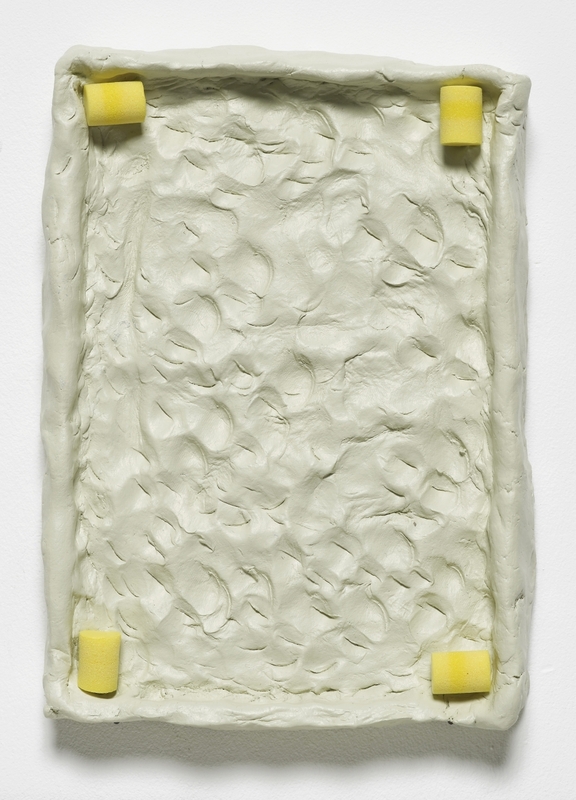 FULL STOP (2014), shown at World Museum but not at the ICA, places Moore’s collages within a translucent, milky canvas. The full stop, the end of the line, is variously described in a repeated rotation of three fragments. 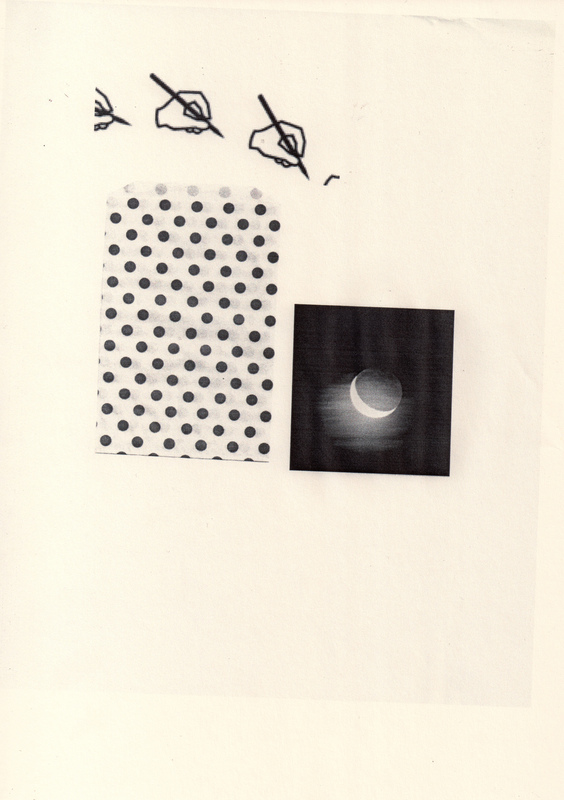 A hand holding a pencil hovers uncertainly over the sphere it has started to inscribe, next to which a rigid mass produced grid of shadowed black dots appear to float above the page. Finally an eclipsed moon, a luminous crescent either opening up or closing within the surrounding darkness, expands the finality of a full stop, describing it as a black hole that is in the process of becoming rather than absolute. 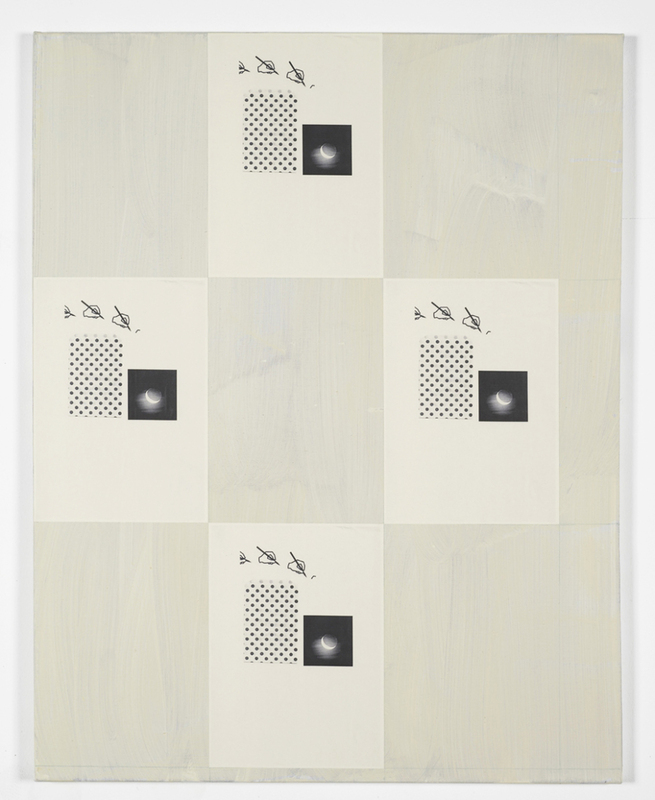 The placement of the four A4 collages forms an additional crude, pixilated full stop, an echo that seems to grow into the rectangular form of the canvas itself. 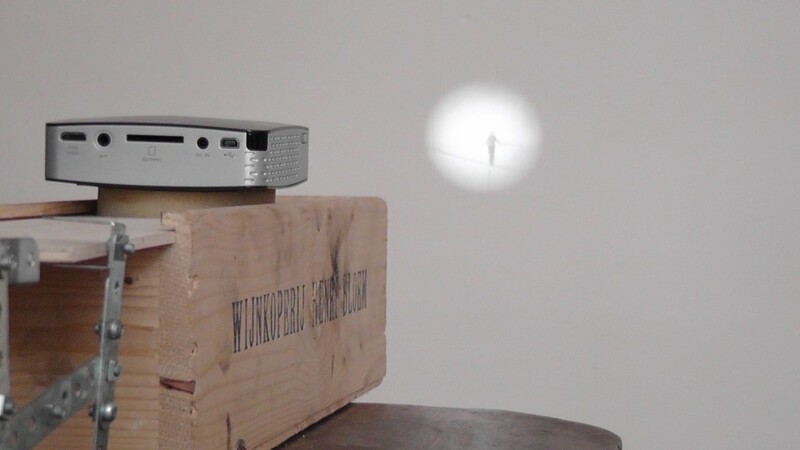 FULL STOP, a rumination on the theme of resolution in an art object, is a ghostly, pensive portrait of the punctuation mark to end all punctuation. 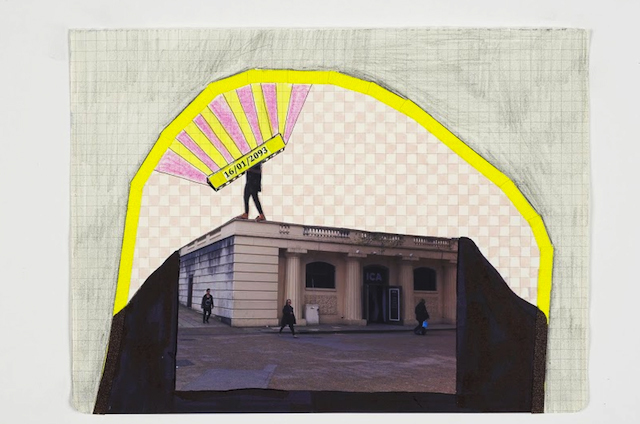 Doodled onto torn out pages of graph paper, the irreverent collaged drawings of Lucy Joyce, entitled Possibilities for the ICA (2014) seem intentionally impossible for the ICA. Whilst the culturally battle worn, faded façade of the ICA remains a rigid constant, all manner of daintily coloured fantasies unfurl around it. Joyce’s interest in the gap between the vagaries of the imagination and the pragmatic realities of actually having to make something bring to mind the entirely aspirational proposals of Superstudio, the influential architectural group founded in the 60s, and famous for pieces such as Continuous Monument. Joyce’s lightness of touch, and lack of an austere, imposing grandeur seems to render her possibilities even less plausible. There’s a subtly dark humour at play in the gentle acceptance of the perhaps purposeful failure for her doodles to appease the apparent necessity for public art to resonate with substantial, recognisable iconography of accessible worth. 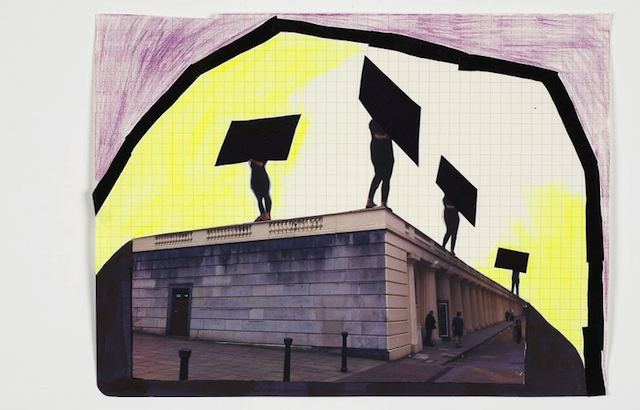 It would have been interesting to see Joyce’s transient, performative possibilities realized and a crashed car mounting the pavement on The Mall, or black clad figures carrying obtuse, monolithic placards around the roof of the ICA like dark-matter ring girls. Like the work of Superstudio, they are perhaps more interesting as proposals, not least in their evocation of the uncomfortably silent arch of a bureaucratically raised eyebrow asked to consider their rhyme as reason. Emily Neu’s With Choir (2014) reads as a complex interrogation of artistic practice distracted by the practice itself. Established as an interview with another artist, sporadic laughter from the live audience testifies to the dry humour in this nuanced excavation of the interview process. The choir could also be interpreted as an errant muse, doubting, asserting, mimicking and yawning at the artist’s shoulder as they come to an understanding of their own or another artist’s work. BNC2014 repeatedly deposits its potency within such memorable fragments: Stacie Guthrie’s shattering oversized egg, the luminous shepherds in Camille Summers-Valli’s Black Mesa (2014) leading the snow-matted sheep that fade into the snowy landscape, or Matthew Humphreys Goodbye (2014), a genuinely touching ode to visiting your parents. 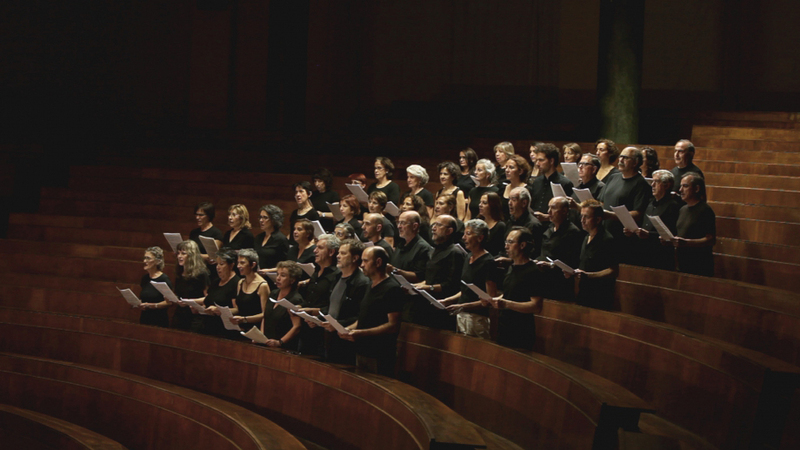 Claiming the Echo (2012) by Marco Godoy, is an elegiac yet uplifting meditation on the vocal form of demonstration. Godoy describes protest as a kind of pristine ancient chamber, a varnished wooden lung that on occasion is peopled with the black shirted voice of dissent. 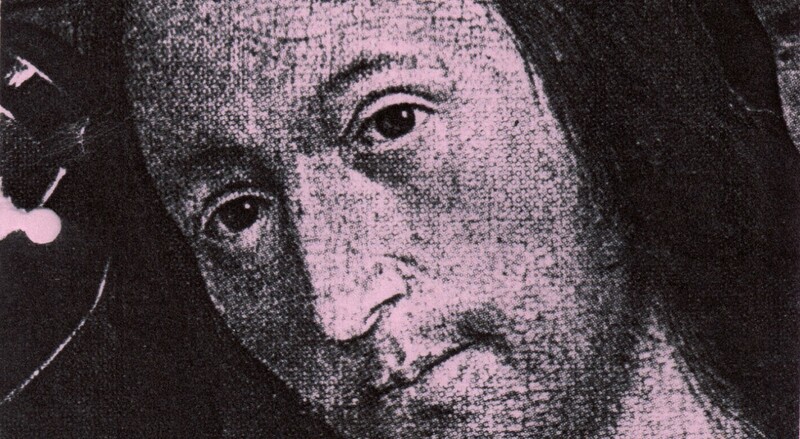 The choral structure and theatrical enunciation revitalizes the words, infusing them with a gravitas nullified by the trivializing repetition and transience of the media, or the turbulence of their origins. There is a moment in a Fellini’s La Dolce Vita, when Steiner meets Marcello in a church and reflects on the sound of the church organ: “We are no longer used to hearing these sounds. What a mysterious voice, it seems to arise from the bowels of the earth”. Godoy restores something fundamental and essential to the brittle, fractured expression of contemporary unrest, using music to bring depth and dignity to otherwise broken words. And so we return to the issue of protest. Godoy restores something fundamental and essential to the brittle, fractured expression of contemporary unrest, using music to bring depth and dignity to otherwise broken words. If We’re All Very Disappointed does resonate with any of the 55 artists in BNC2104 it might be in the realisation that the exhibition isn’t necessarily the golden egg of discovery most related press alludes to. ‘The best prophet of the future is the past’, and reading through the past 15 or 20 years of catalogues you might ask yourself how many of the previously selected artists share the spotlight with those mentioned in the annual press releases. You might also ask yourself why you think it matters. You might further ask what has happened to the usually elegant BNC’s catalogue. To BNC’s credit, the programme of events that now accompanies the annual exhibition engages with the problems of artistic practice after education. Amazingly, this is widely ignored by most fine art courses set on cultivating a protective bubble of immersive creativity, and fearful that any allusion to professionalism might taint or distract from artistic development, an aspect of mistrust repeatedly echoed in the popular press, and tied to romantic delusions of what art is or has been. Depending on your footing and enthusiasm for acronyms, BNC could variously stand for blighted noble creatives, bloated noxious chancers, broken nervous contenders, beautiful new chapters, brilliant novel contortionists, or brazen neurotic curiosities. Whatever your response, it’s an absurdly challenging life ahead for a graduate artist, and many of this group of artists may not be making work in a few short years’ time, unable to juggle their yearning with earning. If you haven’t already done so, you can visit BNC2014’s third leg at Newlyn Art Gallery and The Exchange in Cornwall between March and May. An apt setting by the sea, wish them well as their journeys move into another phase, and if any do prodigally return as a name to entice future generations via motivational press releases, you can say you were there to wave them off as they knelt into the waves and melted like a sandcastle into the artistic tide.